Russian President Dmitry Medvedev on Monday defended the Syrian regime against sanctions for its crackdown on protesters and warned British Prime Minister David Cameron of the dangers of such a move. Cameron met Medvedev for talks focusing on Syria and bilateral disputes as global frustration mounted with Russia's continued support of its ally despite President Bashar al-Assad's months-long repression of nationwide protests. A visiting aide to Assad said 1,400 people -- half of them Syrian security and army forces -- had died in violence since the demonstrations erupted in mid-March and rejected an estimate of 2,600 deaths from UN human rights chief Navi Pillay. Nations such as France have accused Assad's regime of committing crimes against humanity and the foreign ministry in Paris said Monday the UN Security Council's inability to approve a resolution on Syria was "a scandal". But the Kremlin chief refused to give any ground on what is fast becoming a heated sequel to the two sides' war of words over the NATO-led campaign in Libya. Medvedev insisted that Russia was ready to put more pressure on Assad and argued that his differences with the West were "not dramatic". Yet he also stressed that any punitive actions must be applied equally to both sides because the opposition was continuing to reject calls to engage Assad in direct talks. "This resolution must be strict, but it must not lead to the automatic application of sanctions," Medvedev said in reference to action proposed by Western powers. Russia has blocked previous attempts by the world governing body to sanction Assad's regime and is promoting a separate draft resolution that simply calls on both sides to open negotiations. But Medvedev's push for Syrian dialogue was undermined by a visiting Assad adviser who appeared to reject the idea of establishing contacts with the opposition. "Is there any party in Syria with which (Russia) could mediate," asked Assad media adviser Bouthaina Shaaban. "There is no such party." Her comments were followed hours later by Syrian dissident spokeswoman Basma Qadmani's announcement that the opposition would on Thursday present a list of candidates for a "national council" similar to one formed in Libya. Medvedev's tough talk and lack of progress on the ground left Cameron to acknowledged that the two sides had essentially failed to bridge their gap on the dispute. "There is a difference of perspective between Russia and Britain on this issue," Cameron said. "Clearly, Britain would like to go further. 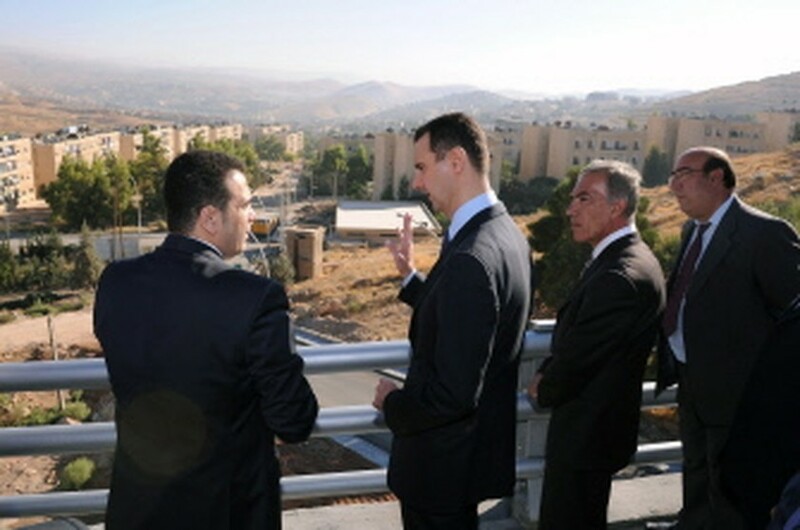 We do not see a future for Assad." Cameron also conceded that a UN resolution may have to be abandoned in favour of a "clear statement about what is happening in Syria". Britain and France have been leading the diplomatic offensive against Assad and Paris issued another barb at what it called some nations' indifference to the bloodshed in Syria. "How long will the international community remain blind and dumb in the face of this endless sequence of crimes? That's the question we're asking today," said French foreign ministry spokeswoman Bernard Valero. The UN resolution Russia is blocking would most likely affect arms sales -- the one area left untouched by the powerful economic sanctions imposed already by the European Union and the United States. Switzerland followed suit on Monday by widening its travel and financial embargo against Assad's regime to 19 individuals and eight institutions. But Russia has been keen to preserve some $4 billion in current and future Syrian arms contracts and has taken more assertive steps in trying to persuade Assad to adopt political improvements that could keep his hold on power. His aide Shaaban said after talks with the upper house of parliament's foreign affairs chief Mikhail Margelov that Syria favoured the cautious reform process seen in Russia since the Soviet Union's collapse. "In the past 20 years, Russia has undergone various processes that led to structural changes," she said. "We want things in Syria to develop the way they did in Russia, in a bloodless manner." Margelov for his part announced that he had received Assad's approval to send a group of Russian senators to Damascus and other Syrian cities to independently report on the situation on the ground. Russia's actions prompted a group of pro-democracy activists in Syria to call for a "day of anger" against Russia's actions to be held on Tuesday. Thousands of protesters had on Friday issued their first call for international protection against repression. But SANA quoted Assad as saying that there was a need "to not get caught in campaigns of disinformation against Syria". Meanwhile reports of new murders and other attacks by Assad's forces continued filtering in from human rights organisations. The United States on Sunday condemned the killing of 26-year-old Syrian rights activist Ghiyath Matar who was said by the New York-based Human Rights Watch to have been a key player in organising anti-Assad protests. The group said he was arrested on September 6 and died in detention after being tortured. "The United States condemns in the strongest possible terms the killing of Syrian human rights activist Ghiyath Matar while in the custody of Syrian security forces," US State Department spokeswoman Victoria Nuland said. The Syrian Observatory for Human Rights told AFP in Nicosia that the prominent 66-year-old rights campaigner Najati Tayara was in a "very bad" condition after having been severely beaten at a Homs prison in central Syria. The Syrian group said security forces had arrested "more than 70,000 people" and "15,000 of them are still in detention". The six-nation Gulf Cooperation Council meanwhile issued a statement urging Syria to immediately stop its "killing machine" against anti-regime protesters.